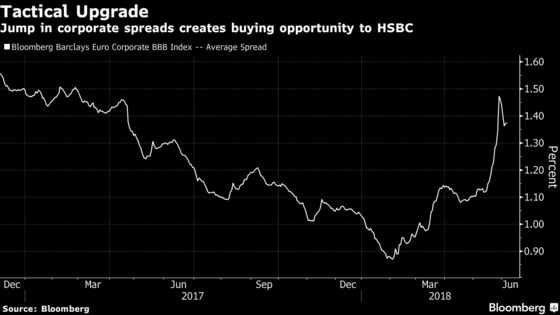 (Bloomberg) -- HSBC Holdings Plc’s Steven Major is starting to show a little less conviction on two of his big investment calls of recent years: bullish Treasuries and bearish credit. The shift comes as traders shaken by weeks of turbulence across asset classes regain their footing. In European credit markets, the biggest high-grade sell-off in more than two years has created a short-term buying opportunity, while Treasuries offer little less value given the Federal Reserve’s policy trajectory, the strategist said in a research note. Major is a key proponent of the view that interest rates can stay lower for longer in the post-crisis era, a stance that underpins his long-term bullish outlook for U.S. Treasuries when many on Wall Street are bearish. HSBC’s fixed-income team is also well known for warnings last year that European corporate debt investors are in a world of pain as valuations don’t reflect liquidity and downgrade risks late in the credit cycle. Ten-year Treasury yields trading around 2.9 percent are in line with the Federal Open Market Committee’s outlook for the path of interest rates, the so-called dot plot, and offer a bit less value than before the recent flight to safety, Major and his team including Lawrence Dyer wrote. They downgrade U.S. government obligations to “mildly bullish” from “bullish” and see, for now, 10-year yields trading in a range of 2.7 percent to 3.1 percent, and for the two-year note at 2.35 percent to 2.6 percent. By the end of the year, the strategists project the yield curve will continue to flatten at a lower level than forecast by the forward market, with the 10-year note tumbling to 2.3 percent. 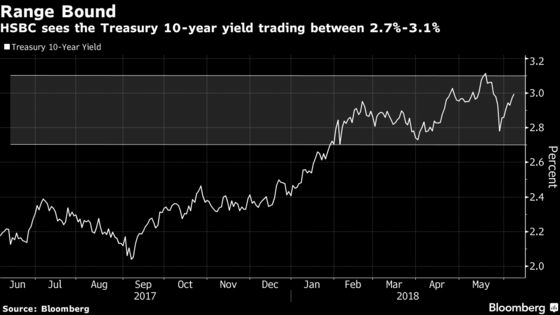 The analysts add that the five-year, five-year forward rate is a better metric to value Treasuries than the price for the 10-year note as it captures the Fed’s policy guidance and shape of the curve. In credit markets, the strategists upgrade European junk and investment grade to neutral from underweight, citing opportunities in BBB rated bonds in the primary market and in credit-default swaps, where spreads have widened following political turmoil in Italy. They maintain a neutral outlook for U.S. credit. As such, the strategists strike a different tone from warnings issued this week over the longevity of the debt bull run as central banks pull back stimulus. KKR & Co.’s Jamie Weinstein, for example, said on Wednesday that investors are placing increasingly risky bets on new issues rated just above junk.